Unfortunately its been decided to cancel 37025 summer tour, whilst last night was a mechanical success there is still loads of work needed to be done before its in a condition that able to be in a presentable condition to work passenger trains and decided the timescales was too short. It is on track to appear late summer at Bo'ness however. Gents, we need your help to find out who the person or persons are who have stolen both sets of GEC Control Cards from 37905 & 37906. So the question is who would want these Cards as they are of no use to any other class 37 unless its is 37796-37803 37905-906, We would like the Cards returned ASAP as our locos are of no use with out them,to replace them would cost us in the excess of £50k? so would you all put the word around that these Cards have been stolen from the Severn Valley Railway and at Meldon Quarry. A reward of £3000 is on offer for information leading to names of the people who have stolen them and the safe return of the Cards. IF YOU ARE THE PERSON WHO HAS STOLEN THEM,PLEASE RETURN THEM ASAP. The POLICE have been informed and thay are taking the theft seriously. If you have any information that may help in the return of the Cards you can contact me at the following email, d444.middleton@btinternet.com or my phone 07900132128 text or voice message. ALL WE WANT IS THE CARDS BACK IF YOU CAN HELP PLEASE DO IT FOR THE BETTER OF OUR LOCOS. 410 Riccarton-Mossend 6D61, load 9 TEA, dep 148 early. 422 Bescot 6W56 2129 Bescot-Aberystwyth. 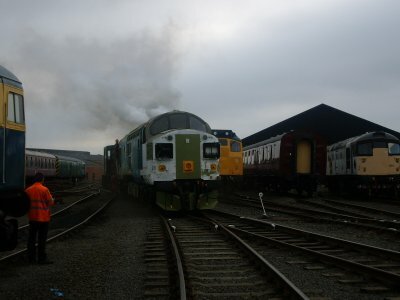 Mark Elderkin formerly of Pathfinder Tours is venturing into the Railtour market in association with Past-Time Rail with The Buxton Forester, on the 15th September.